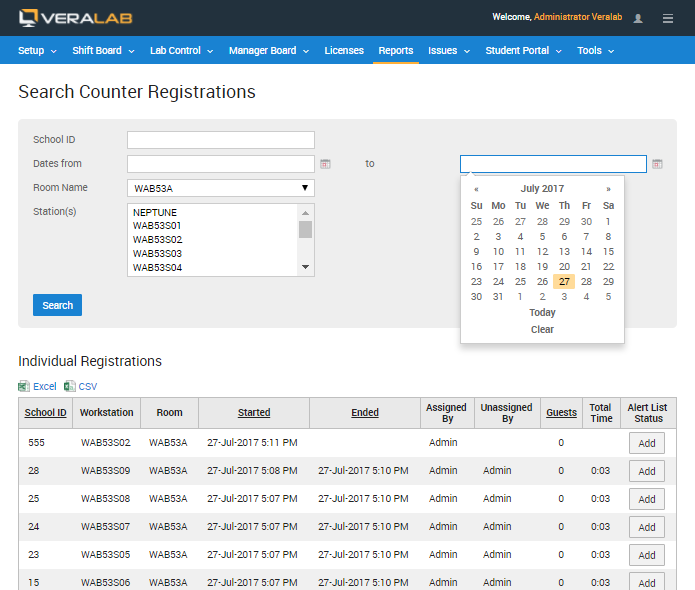 VeraLab Features - VeraLab Computer Lab Software | VeraLab Inc.
VeraLab is a complete Computer Lab Management Suite. 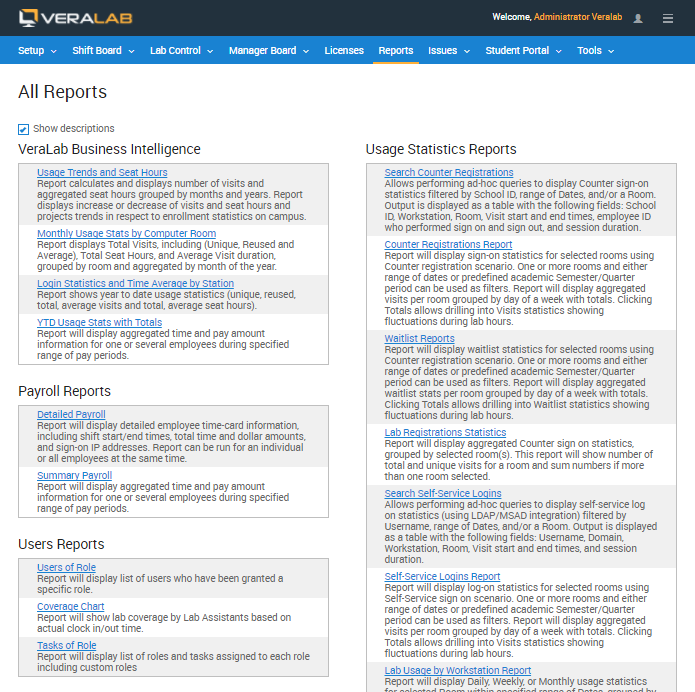 Out of the box version is packed with tons of handy features and reports. It can be cutomized even further to meet your environment-specific requirements. Here is the list of features you will enjoy out of the box at no extra cost. 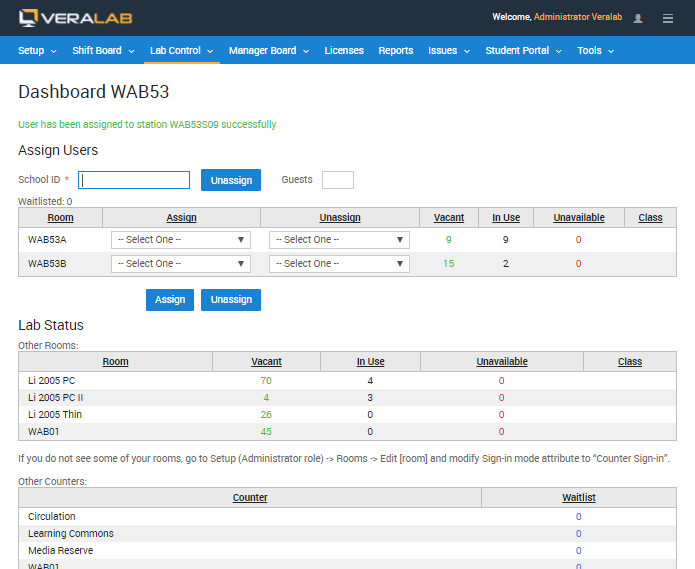 Users are assigned to workstations by Lab Assistants through Dashboard application or via self service. Unattended workstations can be locked to prevent unauthorized user access. Screen Locking can be integrated with user sign-in or performed on demand. Users will be warned several minutes before their user session times out, so they can complete their job before the workstation gets locked. 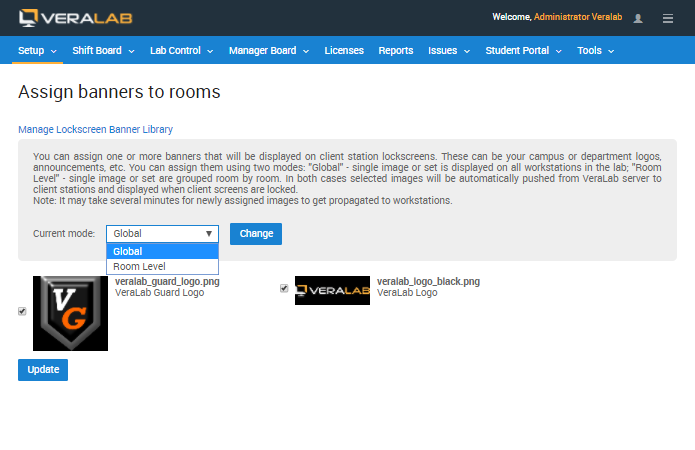 "Strict", "Liberal" and "None" locking modes can be specified on the system level and overwritten on the Room, and Workstation levels. In "Strict" mode, a workstation gets locked when user signs out and unlocked when user signs in. In "Liberal" mode, a workstation gets unlocked when user signs in but is doesn't get locked when the user signs out. In "None" mode, locking is not integrated with user sign-in. 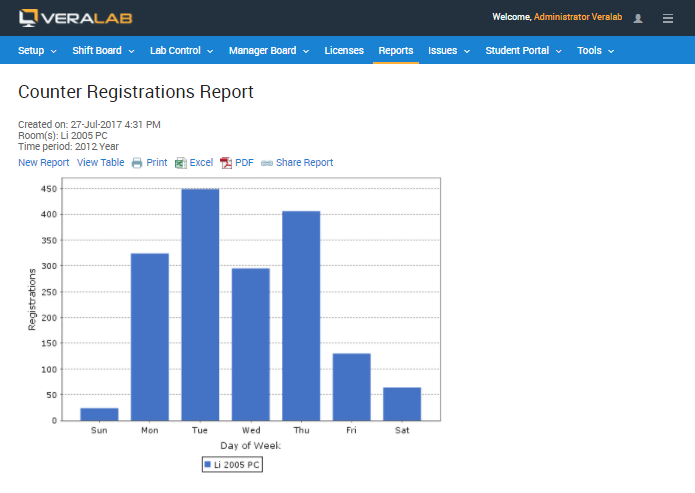 Dashboard may be integrated with card-readers to speed up sign-in process. Sign-in data is saved to access log. 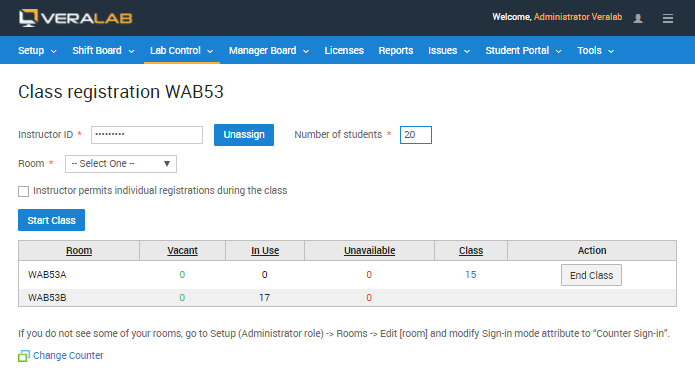 Access logs can be searched to find users who occupied a particular workstation at a particular time or to find workstations that have been occupied by a particular user. Violators can be added to the Alert List. 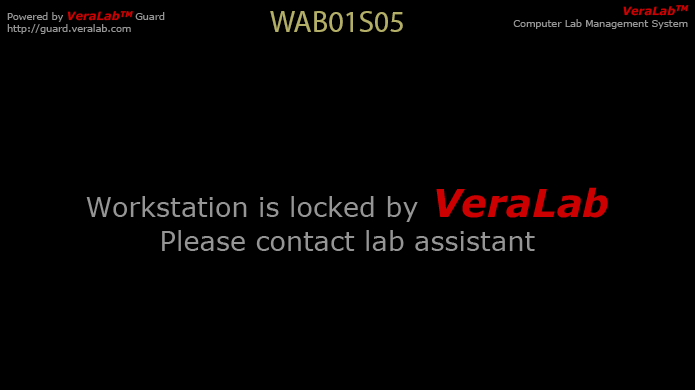 Once a violator from the Alert List tries to sign-in, Lab Assistant will get a warning. 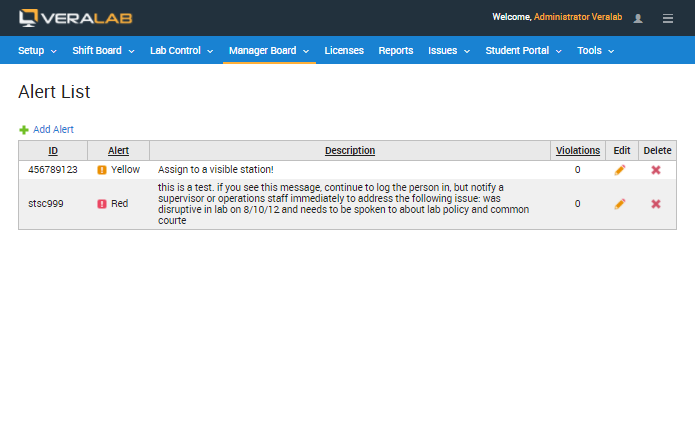 Threat levels can be associated with each Alert List entry to allow for a policy that prescribes different actions for different types of violators. 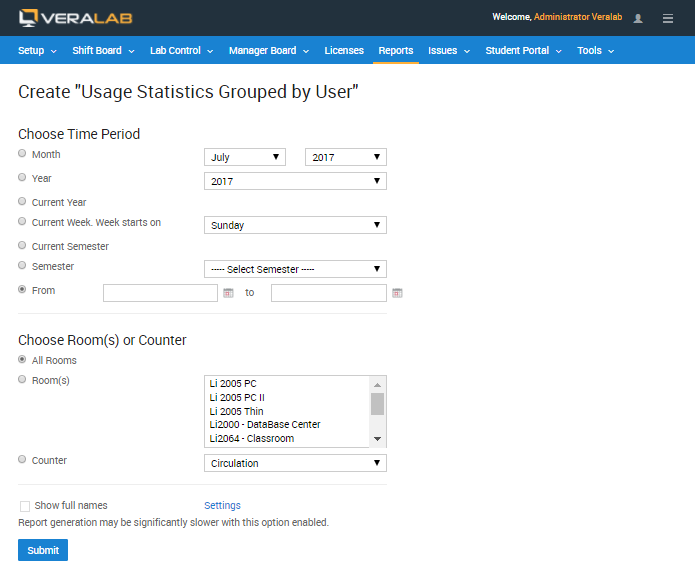 In case the lab occupies multiple rooms, Lab Assistants can see the occupancy of all the rooms and redirect incoming users to under-occupied facilities. The entire room can be marked as reserved for a class. The instructor who teaches the class can indicate whether she/he permits other users to occupy remaining workstations. 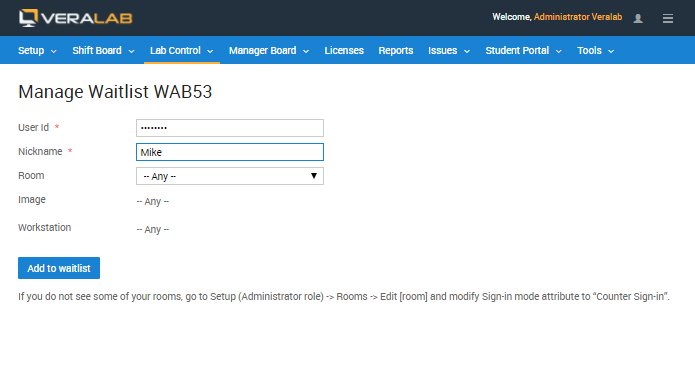 In case there are no workstations available for sign-in, users can be added to waitlist. Users can choose wait-listing criteria such as "wait for any machine in the room", "wait for a machine of a particular type", or "wait for a particular machine". 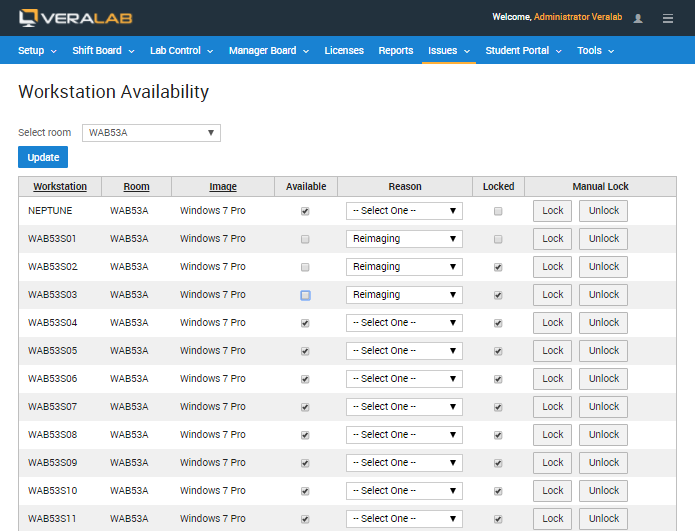 Lab Assistants get notified once the possibility to assign a waitlisted user to a machine arises. 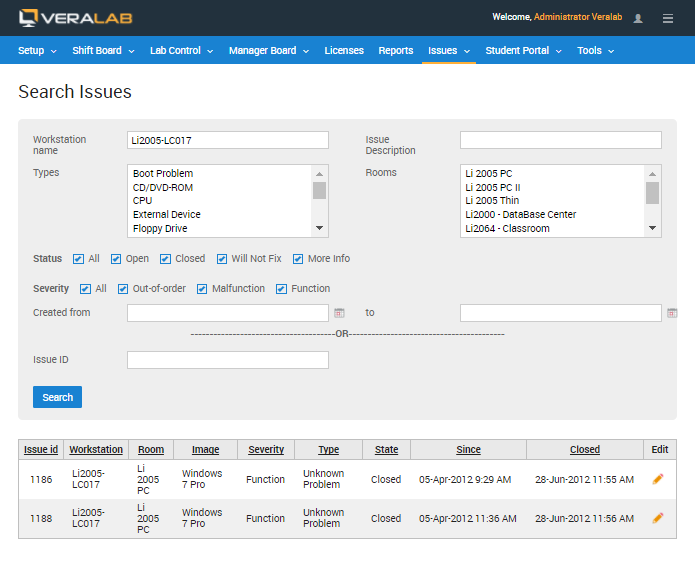 The system keeps the list of maintenance issues associated with workstations. Once a new open issue is submitted, Technicians get notified by e-mail. Each Technician can view the list of currently open issues. Lab personnel can search the issue database specifying various search criteria. Each issue can be ranked by severity, type, priority, and status. 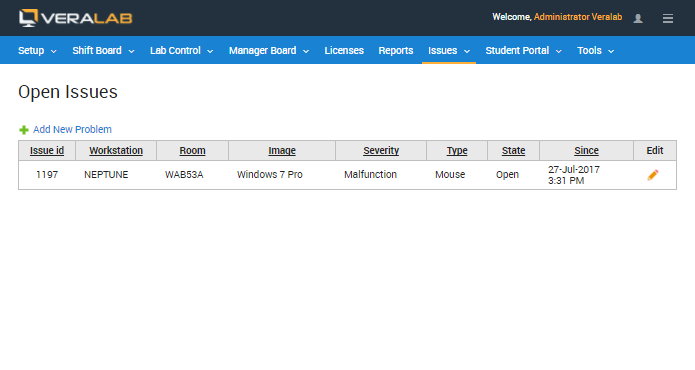 Custom values of these criteria can be added during the system installation. 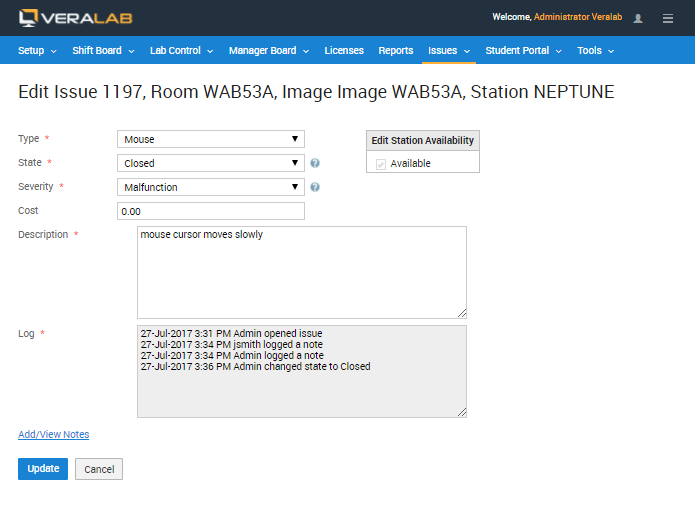 Technicians can mark workstations unavailable for user sign-in. Lab personnel can collaborate on issues by adding notes. Once a new note gets submitted, issue creator and all technicians get notified by email. 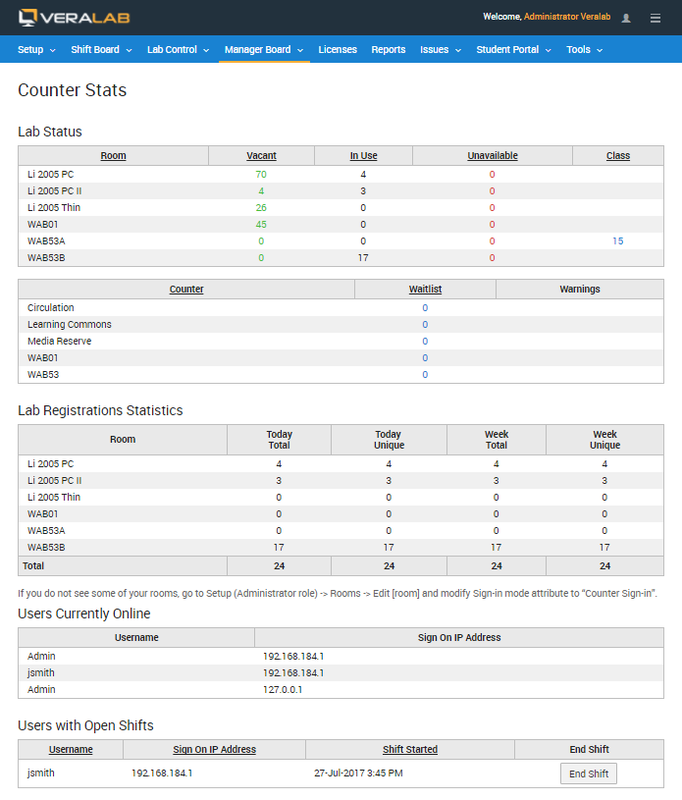 Lab Managers can view the current status of the lab through Manager Dashboard. Lab Assistants must clock in/out when they start and end their shifts. 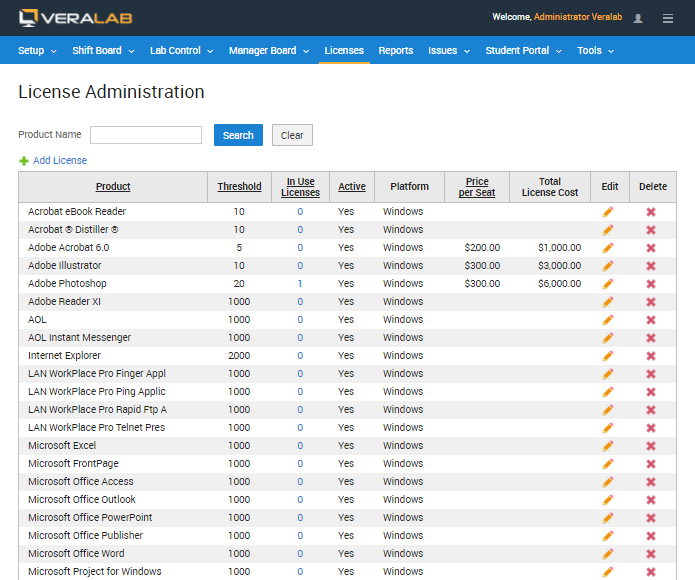 This data can be used later for generating lab coverage and payroll reports. 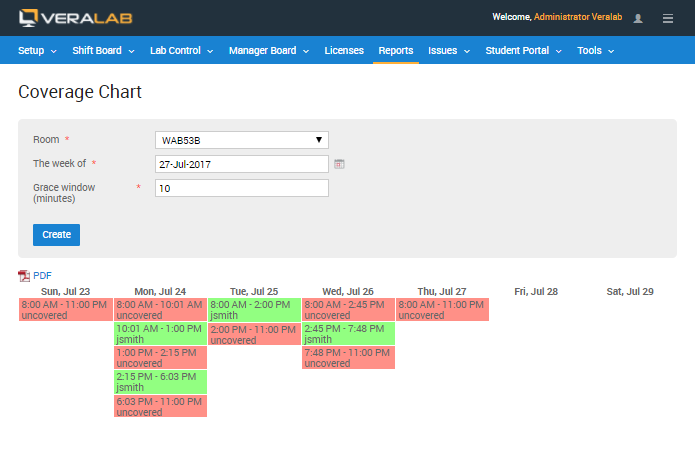 Lab Managers can create shift schedules and lab coverage charts. 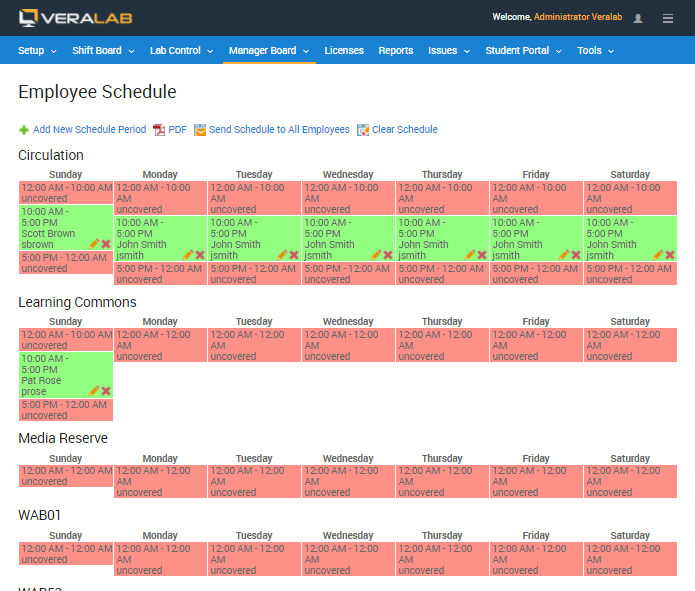 Coverage Chart reports show lab coverage by Lab Assistants based on actual clock in/out time. 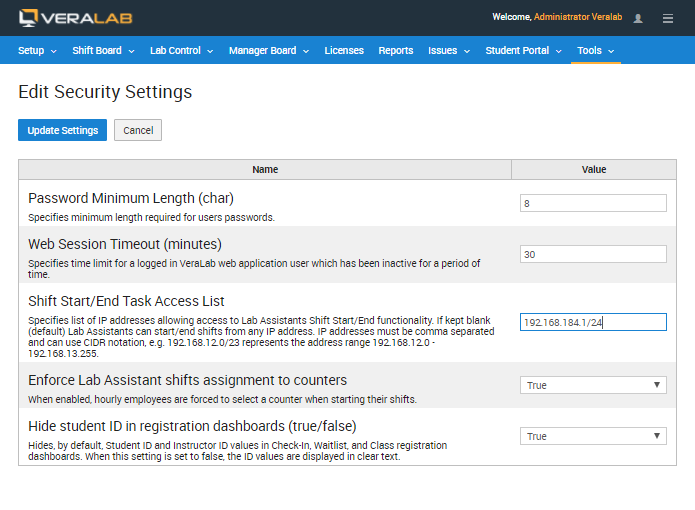 Managers or administrators can restrict access to Clock In/Out task by IP address or IP range. Payroll data is calculated based on Lab Assistant rate and attendance records. Payroll data can be exported in the form easy to submit to HR or Accounting department. 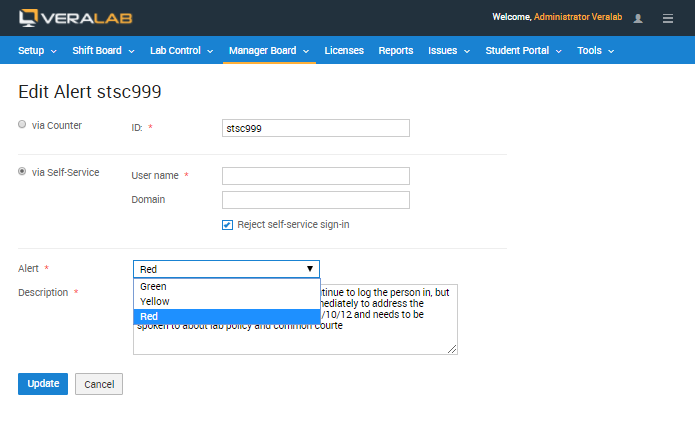 The system can enforce a policy permitting only limited number of users in the entire lab to use a particular application. That leads to smart purchasing of a limited number of software licenses while still installing software on every machine in the lab. 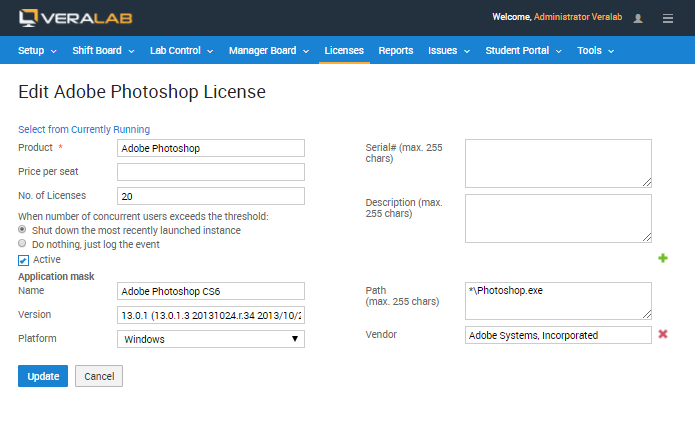 Alternatively, the system can be set up to work in "info-only" mode, when it registers violations of concurrent license terms without shutting down the application. System can prevent users from running a particular application such as file exchange clients, games, or instant messengers. System facilitates the analysis of application usage and cost of ownership data. 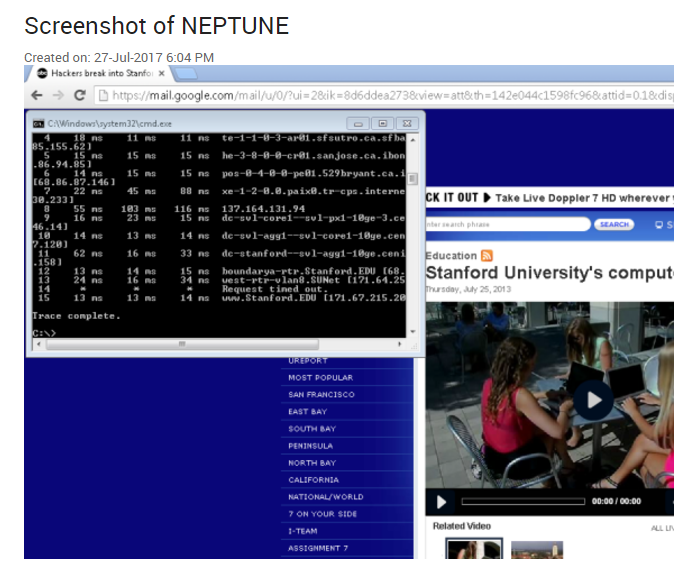 Security Administrators can take screenshots of user displays as evidence of malicious activity or cheating during tests. 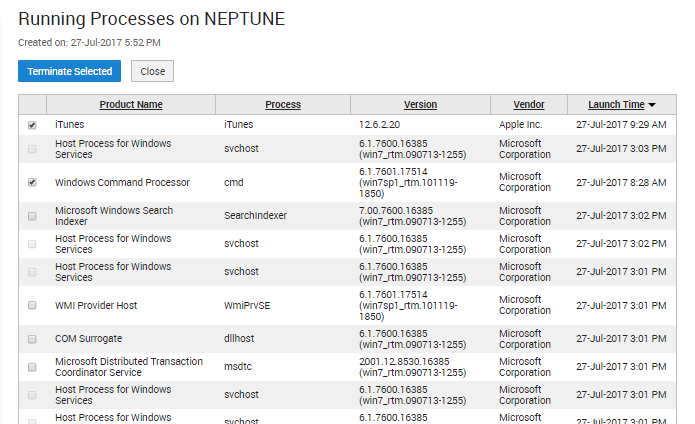 Security Administrators can view the list of processes run on each workstation. They can also kill selected processes running on user workstations. 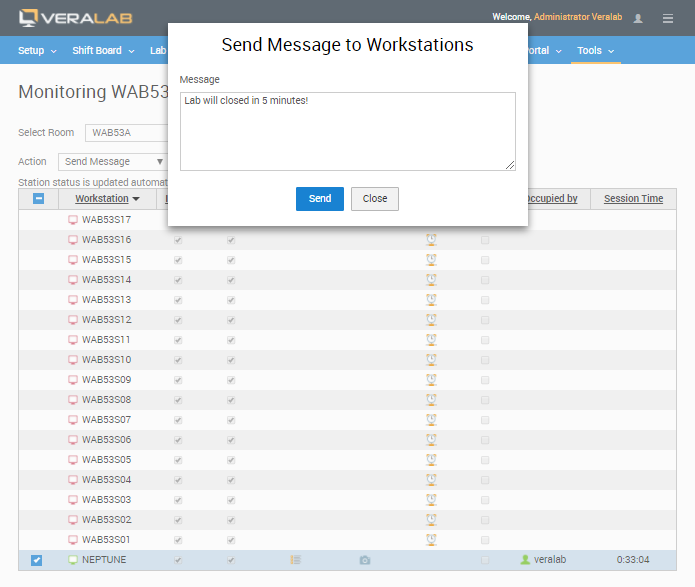 Security Administrators can send messages/announcements to workstations. 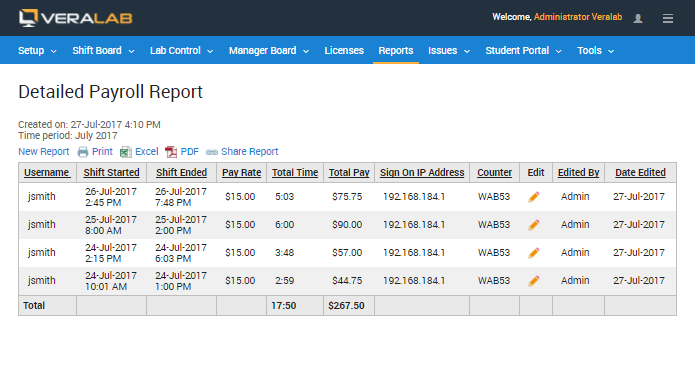 The system can present transactional data as reports in tabular and graphical form. Each report allows user to set a detailed search/filtering criteria. 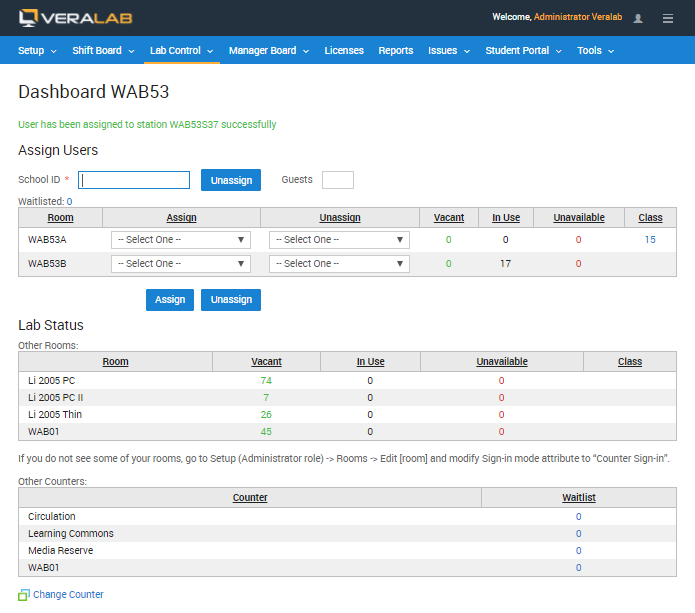 There are many built-in reports providing statistics about your lab environment and usage patterns. 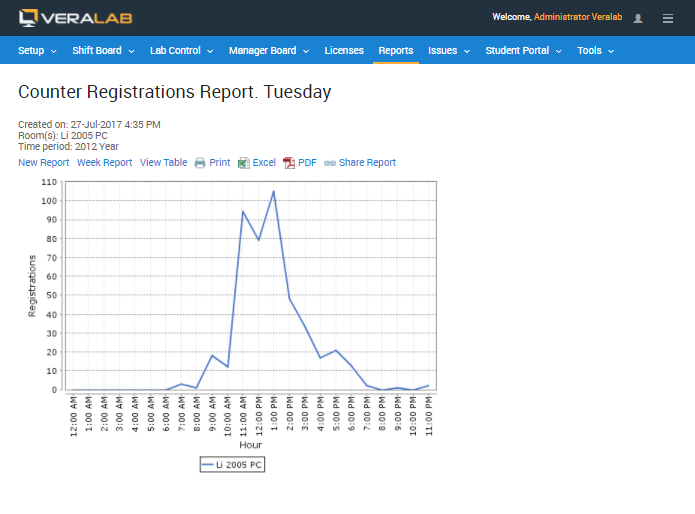 Lab Usage reports show sign on activity by users on a particular day of the week or on a particular hour of the day. 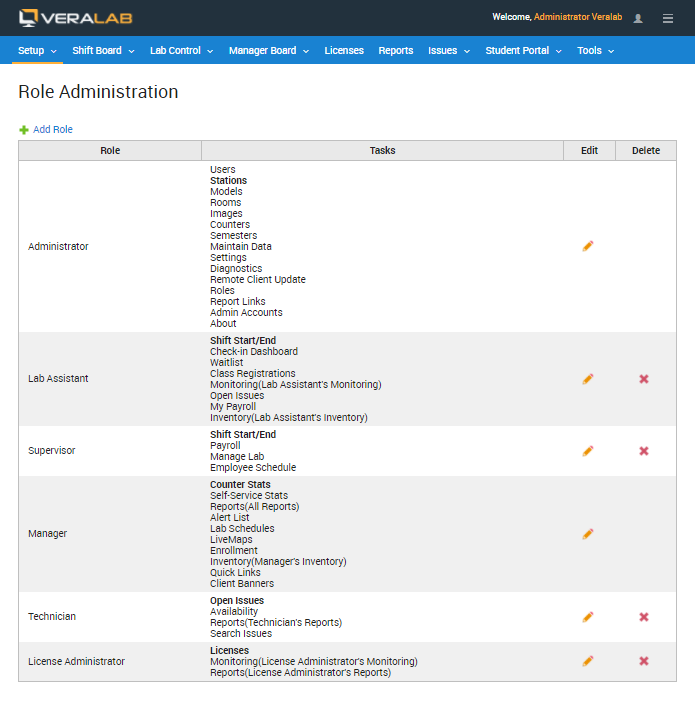 Out-of-the-box installation provides predefined Lab Assistant, Supervisor, Manager, Technician, Administrator, and License Administrator roles. Each role has a set of tasks associated with it. 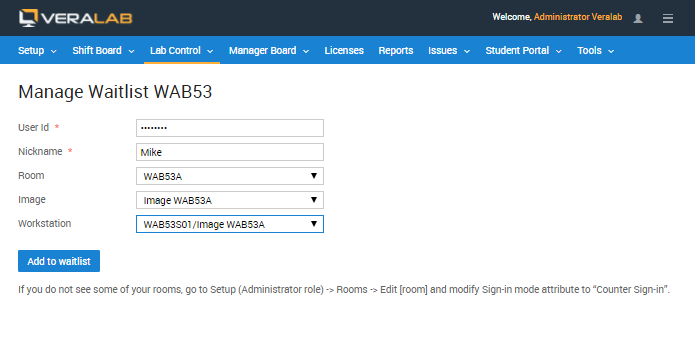 Custom roles can be configured if desired. Custom screen banners can be broadcasted to client displays. Banners can be university logos or announcements and rotated in round robin fashion. 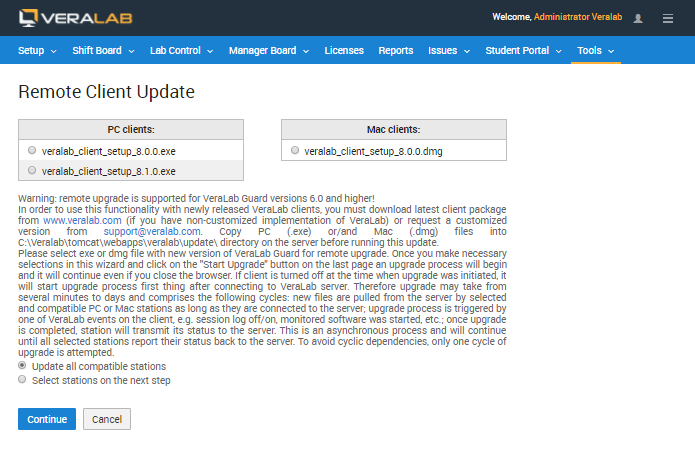 VeraLab client software can be updated/upgraded directly from the server.